We Have Confirmation On What Caused Solange To Attack Jay-Z! According to our source, who would like to remain nameless because of his ties with the entertainment industry, Solange Knowles attacked brother-in-law Jay Z because he was being a bit too attentive to designer Rachel Roy at the Met Gala after-party on May 5th. Our source, who was present at the same event as the Knowles-Carter clan, said that before Solange started going flimode on Jay-Z in the elevator, she reportedly yelled at Roy to keep her distance. 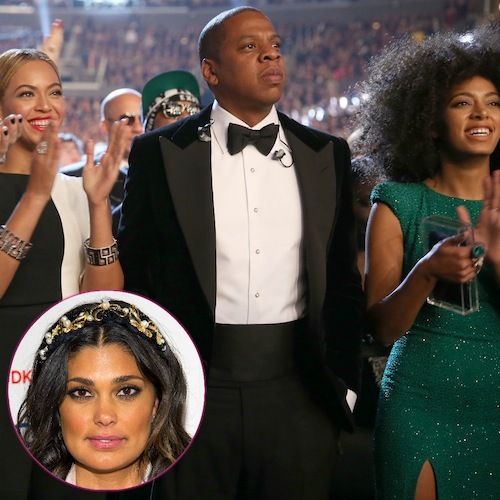 Apparently, whatever Jay-Z had going on with Rachel Roy triggered Solange’s protective side. When she saw that her sister didn’t like it, she immediately came to her defense. Roy used to be married to Damon Dash, Jay Z’s former business partner. Dash took to Instagram to stick up for Solange, calling her a unique soul. “I am actually impressed with her independent spirit, she seems like a fighter,” he said. Roy reportedly didn’t respond well when Knowles told her she was “too close” to Jay Z, a source close to the scene said. “Rachel is combative and a tough girl, she didn’t back down,” the source said. Both Beyonce and Jay Z tried to intervene between Roy and Knowles at the Boom Boom room at The Standard hotel, and the three singers decided to leave. That’s when the beat down was captured on a video camera in the elevator. Another crazy twist to the story is that Rachel Roy is good friends with Kim Kardashain. We’re sure she’ll be at the upcoming May 24th Kimye wedding in Paris. Maybe Bey will accidentally spill some drank on her! This entry was posted in Celebs and tagged Attack, Beyonce, Confirmation, elevator, Hotel, Jay-Z, MET Gala, Rachel Roy, Solange Knowles, source, source reveals, what happened, why?. Bookmark the permalink.